A closely-followed basket of energy stocks hit a nearly 3-year high on Thursday and could keep rising despite long-term market trends. 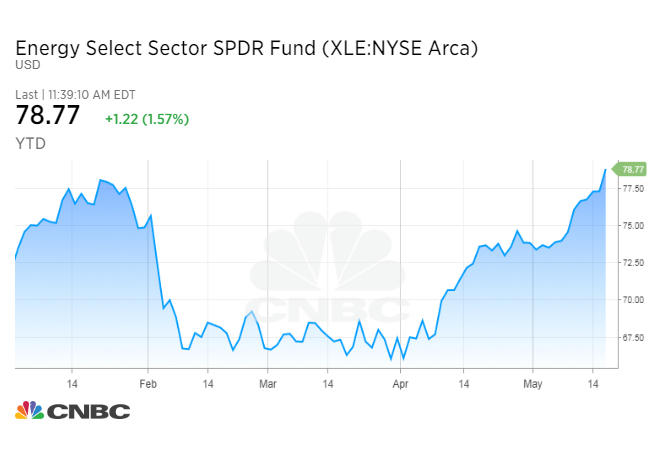 The Energy Select Sector SPDR exchange-traded fund — better known by its ticker symbol XLE — rose as high as $78.83 on Wednesday. 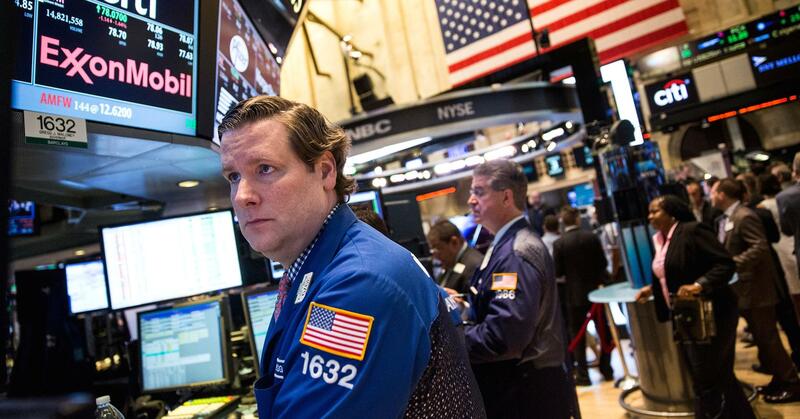 At that level, its trading at its highest since June 3, 2015, when it topped out at $79.07. Energy stocks are finally breaking out for several reasons, but the run-up in oil prices is supporting the sector in the near-term. Brent crude oil on Thursday broke above $80 a barrel for the first time since November 2014, fueled by geopolitical uncertainty after the Trump administration restored sanctions on major crude exporter Iran. First, the XLE topped January’s high of $78.39 at the same time that Brent and U.S. crude are hitting 3½-year highs. 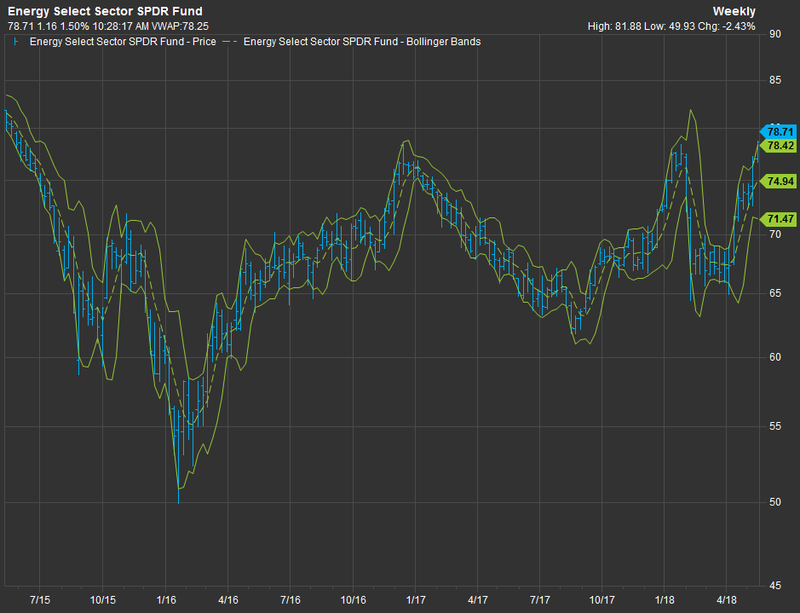 Second, the fund is breaking above the upper Bollinger Band. The so-called Bollinger Bands represent a range that indicates when prices for an asset are either looking expensive or have potentially become undervalued. Rising above the upper Bollinger band often sets up a sell-off that knocks the asset price back within the range. However, it’s possible that history will not be a guide in today’s market because investors are still not holding a lot of energy stocks, according to Friedlander. The XLE is now on pace for its 10th straight day of gains, a feat it has not accomplished since it notched a 10-day winning streak on July 2006. The fund is also on pace for its sixth straight week of gains, its longest week-to-week stretch since September. — CNBC’s Chris Hayes contributed to this story. 0 responses on "Energy stocks just broke through a key level and could keep rising"